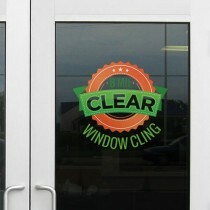 Window Clings are near photo quality and ideal for POP signage on glass or glass-like smooth clean surfaces. They are printed on a glossy material and can be used indoor or outdoor. Clear Window Clings are range in sizes from 3x3 to 12x18 and cling on the front side of the print.